It’s that icky topic that makes you cringe when you even hear the term: child molestation. It’s a devastating and disgusting crime, one that society condemns so much, we often convict the accused in our hearts and minds before we even hear the evidence. Often times these are just and sound assertions, but what about the times when it is not? What would you do if the police showed up at your door and accused you of child molestation? What would you do if you were then arrested for charges that spawned because of the actions of someone else? And how would you handle being incarcerated for two years with 18 left to serve? And after conviction, would you find faith to push forward to continue to fight for your freedom and the vindication of you and your innocence? And one last thing to ponder: how would you cope if you were denied a new trial after the evidence used to convict you was found to be false? If we were to fog bubble back in time to 2011 when this whole debacle began, we would meet a gentleman named Scott Dean. Scott and his wife Renee had a quiet (as political ones can be), quaint life in Columbia County where Dean served as a Harlem City Council member before being elected as a County Commissioner. Dean and his wife had two biological sons and five adopted children from Guatemala. Life was simple and though Dean had some indiscretions at work, Dean was well-liked in the community and a charitable man of faith. Cue mirror-shattering moment. From the get-go, it was evident the State was on a one-track mind. The prosecutor made it known that he planned to introduce evidence of “similar acts” from the past. ADA Parks White referenced a supposed 1984 Virginia incident (when Dean was just 14 years old and two young females (age 12) with a group of other young females) that was never pursued or prosecuted. No charges were ever filed. The prosecutor presented this information to the public before the Judge ever ruled on the admission of such at trial. It was ultimately permitted at trial but what went ignored were the “similar acts” of the victim and her prior false claims against another guardian, as well as her use of similar allegations to have her and her sister removed from their home in Guatemala. It seems the young lady simply used false allegations to leave a home whenever she was unhappy…and she was truly unhappy with her adopted mother, Renee Dean. In 2011, Scott Dean was convicted of two counts of child molestation of his adopted teenage daughter based on her statements and the ‘inappropriate act’ as a 14 year old boy with a 12-year-old girl. He was sentenced to 20 years in prison (the maximum) followed by 20 years probation. A few months after the conviction (but prior to the sentencing), daughter Silda Dean told a DFCS worker that the allegations were a lie. The social worker informed her supervisor and DFCS legal counsel but no further action was ever taken. In March of 2013, Dean’s adopted daughter formally recanted (in a letter) her statements claiming he sexually assaulted her, admitting everything was a lie. Testifying in early October that her allegations were indeed false was legally not enough to grant a new trial. Scott Dean made a couple bad decisions. He chose to wonder outside of his marriage and away from his wife in an inappropriate relationship with a county employee and he chose to rub some folks the wrong way as a politico in Augusta, but neither of these acts render the incessant persecution of a man for such heinous crimes. We utilize due process and the presumption of innocence for a reason. When we allow a case to spiral out of control without discretion and checks, lives are destroyed. The Court of Appeals claimed that “Absolute Proof” isn’t required. Instead, the judges believe that the testimony of the two witnesses met that burden of proof. That testimony has since been retracted. Now what? There is still an opportunity to rectify the situation. We must question the District Attorney, the Judge, the Courts and demand an answer as to why, in light of such vindicating, game-changing evidence, a man still sits in prison with no hope and no chance of a new trial. If a now ADULT victim, freely and willingly admits that no improper acts occurred , why is a man in prison? How can a man be charged with a serious, life-changing felony with no victim? I charge you to consider if this man was your husband, your brother, your father. At a minimum, you would want a fair and just trial with the pertinent evidence. If the prosecution’s case is airtight, a second trial should yield the same result. Keep in mind that if the Courts fail to seek justice, even just once, the wheels will eventually fall off wagon for the entire legal system. While you mull that over, Mr. Dean waits in Georgia State Prison in Reidsville. This entry was posted in Law and Justice and tagged ADA Parks White, Anthony Scott Dean, Augusta Georgia, child molestation, Columbia County Superior Court, Judge James G Blanchard Jr, Law and Justice, Renee Dean, Silda Dean, wrongfully accused, wrongfully incarcerated on November 18, 2013 by Jessica Szilagyi. I read a follow up article this morning about Artiston Waiters, the 19-year old who was shot and killed by a policeman after an altercation back in December. Just yesterday, a grand jury decided not to indict the Union City police officer because, according to reports, Mr. Waiters was attempting to take the gun of Office Lewis and altercation ensued. Mr. Waiters was shot and killed in the scuffle. The WSBtv article said the deceased’s mother ‘is heartbroken over the decision’ stating “Freda Waiters is devastated. It is hard to describe the pain that she is in at this point”. I found this to be a particularly interesting statement because I wonder what Mrs. Waiters cause was driven by: Justice or Closure? Our justice system is a tricky one. But it is just that: a system that seeks justice. It is not a system that was created to provide emotional comfort. That comes from God and your family. It is not a system created to invoke retaliation. That kind of judgement comes, again, from God. The justice systems seeks to hold criminals accountable for breaking the law. In the case of Trayvon Martin, George Zimmerman experienced a prosecution and conviction by the media and by minority activist groups. Whether George Zimmerman is guilty or not is now irrelevant because he has already been tried in an emotionally chaotic public court. Surfacing evidence matters to few because the liberal left has already established an opinion. Martin family members and supporters have pushed for public crucifixion and take minimal account of any other circumstances because their son is dead. But that’s just it: He isn’t coming back. In the case of Artison Waiters, we may never know the full extent of the story because witnesses were lacking. But the officer held an impeccable record with the police department and had outstanding marks from all of his superiors. Should we trust his story based on the oath he took or should we be skeptical? The decision has been made by the grand jury and again, Mr. Waiters isn’t coming back. Both these cases have a strong resemblance to the Casey Anthony trial. Many of us, in our hearts, felt she was guilty beyond a reasonable doubt. A jury did not and they used the Constitutional procedures pre-set to evaluate the case. And Andrea Sneiderman, the woman having an affair with the man who killed her husband. What about her? All of these cases have one thing in common: they stir up emotion. But being angry doesn’t bring them back. Being angry won’t get you a conviction. And being angry won’t make you feel better. As frustrating as it is, the system has loopholes but we mustn’t convict people publicly by media harassment when the correct forum for that is a court room. Remember the Centennial Olympic ‘Bomber’, Richard Jewell? A man wrongly accused suffered greatly for months because the media annihilated him before facts came to light. I’m not saying we shouldn’t have a justice system that prosecutes and I’m certainly not saying we should be more lenient on seeking justice for those who become the voiceless victim. I am, however, saying that it is important to stay focused. There is no room for emotion in a court room. Cases should be tried based on facts and evidence, not on maintaining a memory of a loved one or attempting to fill a void of a loss. Far too often we see convictions overturned after years and years of wasted time and tax dollars because of emotionally-fueled investigations, emotionally-fueled indictments and emotionally-fueled trials. This entry was posted in Law and Justice and tagged andrea sneiderman, artison waiters, Casey Anothony, emotionally-fueled investigations, trayvon martin, wrongful convictions on May 31, 2012 by Jessica Szilagyi. One of the things I’ve enjoyed most while writing this blog is exploring my own views. Trying to explain WHY I feel the way I do about certain issues has really forced me to delve into my own morals and foundations. I’ve always been conservative but I just continue to move further right as each day, regulation and policy passes. As someone who has never tried it and has no desire to try it, I feel as though I can offer an unbiased, logical argument as to why the motion to legalize marijuana should be exercised. Some may say this is against several conservative values. It’s not. Consider the TRUE foundations of what conservatism is supposed to be: freedoms and choices. People seem to think that if something is ‘legalized’ that means everyone will do it. That’s simply not the case. The people who smoke marijuana will do so whether it is legal or not. Fact. So all we are really doing is creating a database of millions of extremely minor offenders and flooding our criminal justice system with pricey maintenance, paperwork and overcrowding. The National Organization to Reform Marijuana Laws (NORML) reported that in 1965, there were 2 marijuana arrests an hour in the United States. In 2008, there were ~100 arrests per hour. HOW RIDICULOUS. Did you know that the majority of marijuana arrests are related to other charges like loitering and speeding? Everyone preaches about ‘victimless crimes’ yet the government monitors them through jail time and probation like they are sexual predators. Why? Police and justice system resources could be allocated to more serious violent crimes instead of needlessly sending ‘offenders’ into the system for victimless crimes. Now, some say that medically it’s detrimental. According to the National Commission on Marijuana, “No significant physical, biochemical or mental abnormalities could be attributed solely to their marijuana smoking…Neither the marijuana user nor the drug itself can be said to constitute a danger to public safety…” Regardless of the overabundance of research saying it doesn’t, let’s say that marijuana did cause a plethora of health problems…so does excessive alcohol use, cigarette smoking, many FDA-approved prescription drugs, McDonalds (and other fast food restaurants), pollution and sticking your head in an oven…but they are all legal and people do them. So please, government, don’t tell us you’re looking out for our best interests. And what happened to choices? I’m surprised democrats aren’t jumping for joy to support this. 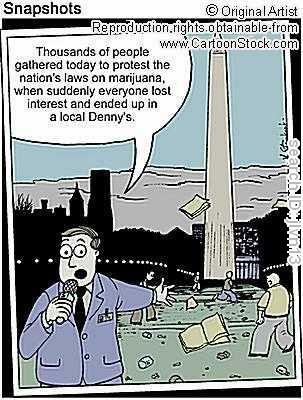 The logical, financial side of legalization? Like everything else in the United States, we could just tax it. The lottery, cigarettes, alcohol…what’s the difference? Those are legal now and marijuana isn’t. (Recall that the lottery and alcohol were once illegal, though). They’d also be able to regulate it. Marijuana is a $36 billion a year industry. Illegal marijuana ‘trading’ right now funds gangs, a real problem in many areas of the country. MJLegal.org says, “We currently spend billions of dollars every year to chase peaceful people who happen to like to get high. These people get locked up in prison and the taxpayers have to foot the bill”. It’s expensive to keep up with roughly 900,000 ‘offenders’ every year!! Now I’m not suggesting that we advertise on billboards or sell it at the local Publix and BP Stations or allow people to light up at Chili’s. But people should be allowed to do as they please on their own time in the privacy of their own property when they are not affecting others. Marijuana’s actual impact on society does not justify a social policy designed to seek out and firmly punish those who use it. So it’s true, the real detriment to society is the War on Drugs. And it’s not just a detriment, it’s a complete and utter failure. This entry was posted in Law and Justice, State Level Stuff and tagged legalizing marijuana on February 6, 2012 by Jessica Szilagyi. The execution of Troy Davis on September 21st has fueled a lot of discussion on the death penalty in recent days. Of course there are the extremists who call for the abolition of the death penalty all together. There are the moderates who believe that the death penalty needs some tweaking, like more appeal opportunities, longer death row time, etc. And then there are the hooligans who think Troy Davis was only convicted because he was a black man who killed a white man. 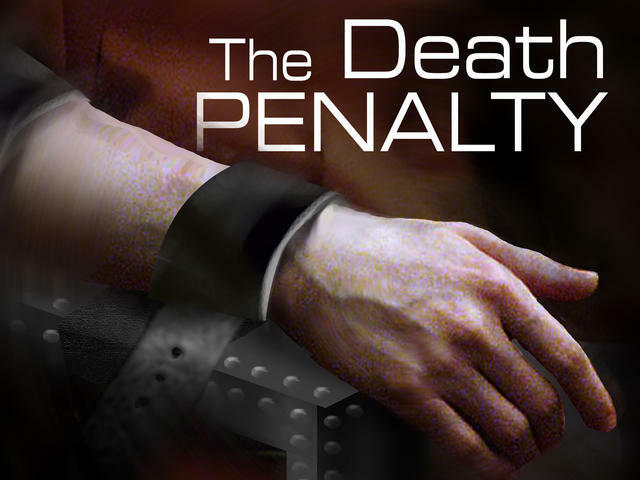 In evaluating the death penalty, there are several aspects that one must take into consideration. First and foremost, the death penalty is NOT a deterrent for crime. It is a punishment for committing a crime. The death penalty, like many other foundations of America, is based on Biblical values. And in actuality, the death penalty has become so humane, that it is no longer feared. Criminals are lucky that they aren’t executed in the same fashion by which they took a life. programming of any kind, activities,” but again, prison is a punishment so why must it be tolerable, or comfortable, or enjoyable? The conditions are pretty nice. All states offer television and a limited number of states offer educational training and group recreation time. Dragging on the process of appeals is costly. It costs $90,000 more annually to house a death row inmate than it does someone sentenced to life imprisonment. Another misconception? African Americans make up the majority of death row. Wrong. According to the Death Penalty Information Center (DPIC), 43.68% of inmates on death row are white, 41.77% are African American, 12.12% are Latino and the remaining 2.43% are categorized “other”. Further, many believe that the South is more likely to sentence a black man to death row than a white man, but Alabama has equal numbers of both, and Florida, Kentucky and Tennessee have more white men on death row (3). You don’t have to support the death penalty. You can certainly move to one of the 16 states that has banned it: Alaska, Hawaii, Illinois, Iowa, Maine, Massachusetts, Michigan, Minnesota, New Jersey, New Mexico, New York, North Dakota, Rhode Island, Vermont, West Virginia or Wisconsin. Or better yet, another country. This entry was posted in Law and Justice, State Level Stuff and tagged death penalty cost, death penalty race, troy davis on September 22, 2011 by Jessica Szilagyi.